In a bid to give parents a way to track their child's health, Cognoa offers an assessment tool to conduct a child development screening at home. Parents of young children often watch their kids closely to make sure they hit all the usual developmental milestones at the right times. When a child misses a milestone or exhibits symptoms that just don't seem right, parents visit a pediatrician. But that doesn't mean the child who may need help gets seen by a specialist right away. In fact, the average wait to see a specialist with a referral from a pediatrician is over a year, said Brent Vaughan, CEO of Cognoa. Palo Alto, CA-based Cognoa saw a way to get faster attention for those children who need it by putting a tool in the hands of parents. The company's child development screening technology can be used at home to give parents more information about their child's development. "Parents, on the average, see the signs and symptoms of developmental delays--not just autism--but parents just see delays. They see speech delay or they see social delay. Parents are good at this," said Vaughan. The Cognoa platform, which can be used for children 18 months to seven years old, doesn't provide a diagnosis, but does give a detailed evaluation of a child's skills for qualitative discussion with a pediatrician. The company describes the technology as "giv[ing] parents peace of mind by identifying where a child is on track and what parents can do to help the child improve," according to the corporate website. Parents answer simple questions about their child's behavior and skills, and can upload short videos of their child as well. The information gathered is used by the Cognoa technology to evaluate the child's development. Hear Cognoa's Justin Ho discuss "Digital Health Lessons to Empower Your Product Design" at MD&M West in Anaheim, February 7-9. The idea for Cognoa sprang from machine learning and data science research that the company's scientific founder, Dennis Wall, PhD, conducted while in the Department of Pediatrics at Harvard Medical School. Wall, who is now on faculty at Stanford Medical School, was conducting genomic research to try to detect and identify autism earlier, but realized that there were also "huge delays, years of delays on the phenotypic side, in the diagnosis," Vaughan explained. Cognoa doesn't just look for autism. Developmental delays of all kinds--speech, language, ADHD among them--are surprisingly common, occurring in one in six U.S. kids, Vaughan pointed out. The American Academy of Pediatrics recommends developmental screening for children at 9, 18, and 30 months, as well as whenever a parent feels something might be wrong. Cognoa's evaluation platform allows parents to answer simple questions. Wall sat in on the diagnosis process, observing how clinicians interview parents and children to gather numerous data points. He also had access to archived data at Harvard and could review all the various data points collected for thousands of families, Vaughan said. "What he realized is that they're collecting all this information and it's just causing these backlogs," Vaughan said. Vaughan explained that Wall applied machine learning to data gathered from over 10,000 patients and winnowed down the long list of information to less than one dozen pieces of data. The proprietary algorithms using these data were tested against archived data, and he found that this short list of data points showed 99% accuracy for detecting autism. Those findings are summarized in a 2012 article published in PLoS One, "Use of artificial intelligence to shorten the behavioral diagnosis of autism." In it, Wall and his coauthors wrote that a 7-question classifier, covering attributes like imaginative play, direct gaze, group play, and reciprocal conversation, were tested against 1654 patients with autism from the Simons Foundation and 322 patients with autism from the Boston Autism Consortium and "our classifier performed with nearly 100% statistical accuracy." This screen was studied in a prospective, 222-child study and was found to have a sensitivity of 89.9% in detecting autism spectrum disorder and 79.7% specificity, according to the findings recently published in the Journal of Autism and Developmental Disorders. Discussing the study, Vaughan pointed out, "In the areas where we got it wrong, a number of those cases where they ended up not having autism, they ended up having a similarly complex dianosis . . . from the parent's perspective, we got it right." Though Cognoa is already gaining national attention--it was one of 10 finalists in the Impact Pediatric Health pediatric healthcare innovation pitch competition at South by Southwest earlier this year--the company continues to work on more opportunities and research. A prospective, multi-center study with childrens' hospitals is underway to validate the technology's ability to identify children with severe delay. The goal is to expand Cognoa's enterprise tool for childrens' hospitals to be able to triage specialist attention for the children with most serious delays. The technology also benefits from parent feedback on what diagnosis a child was given after being seen by a clinician. It follows that Cognoa would try to offer other tools for parents and children. The company developed a mobile app that parents can use with their children for pediatric sleep disorder. Vaughan noted that while the app is not a telemedicine solution, it gives parents a place to log behavior and actions. 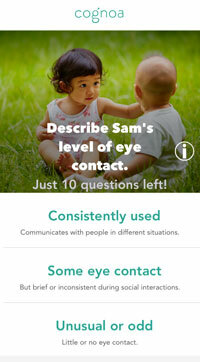 The app then points parents to the insights and interventions that experts recommend. A six-week pilot has already been conducted for pediatric sleep disorder and Cognoa is planning to develop versions for speech and language. "Over 90% of the parents told us at the end [of the pilot] that their children slept much better than they had before," Vaughan said. He added that Cognoa is working with two top pediatric sleep doctors to build the technology into an over-the-counter responsive medical app. "One of the reasons [these specialists] are working us is they have a roughly one-year wait for parents to see them." For now, the technology is direct pay, but Vaughan emphasized that the price point is lower than a single co-pay often is to see a therapist. He said that Cognoa is committed to doing the necessary research to eventually secure reimbursement coverage. Cognoa is not a threat to the pediatrician, but rather another tool for both clinicians and parents, Vaughan pointed out. "We never try to replace the primary care physician. We're giving the primary care physician more tools to refer to versus saying, "Go stand in line for a year." Here's something that you can start working with."